​My journey is called a miracle by many who know me. The mere fact I am alive today and breathing is a blessing each day. The heart of my miracle resides in a 14 year battle with Anorexia that almost took my life on several occasions. 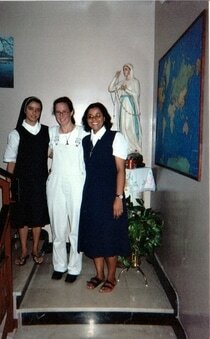 I spent my life in and out of hospitals and treatment programs, all the while dedicated to my prayer and my calling toward becoming a religious nun. Some did not believe I would see that day, for I was dying in my illness. My prayer, my faith never failed me, it was/is my rock and my saving grace. In this story below, you will hear how Lourdes was introduced to me, the rest of my story follows. In 2000 a dear friend from church was dying of cancer. She was an amazing woman of great faith and fight who stood by me when others fled. In her final weeks she took a pilgrimage to Lourdes, France where Our Lady appeared to St Bernadette. My friend, Dianna, was hoping and praying for a miracle, so often heard about in this small village where thousands upon thousands travel each year. I, on the other hand, prayed the novenas for her along with the parish, my rosary in hand, with great skepticism. I prayed with the image of Christ. I always felt people created what they wanted to see and hear within the great apparitions of Mary. But when Dianna returned home, something changed in her. She fell much worse very quickly and soon she was close to dying when she wanted to speak to me. I made my way over to her home, never expecting what she would tell me next. As she began to speak, I listened, praying intently for her as she told me that while she was in Lourdes and having her bath in the piscine, she had a vision of me working there, ministering to the sick and dying. She, then, made me promise that I go minister in her name after she passed. I wanted only to bring her peace at this time and agreed. Almost a year after her death, a priest friend says to me, ‘You know you have to do that?’ ‘What?’ I asked surprised. ‘Go to Lourdes as Dianna asked.’ ‘No way!’ I exclaimed with intense fear. Yet, I knew in my heart he was right. Soon, still in my illness, I began to find a way to make it happen. I am a dreamer at heart. Tell me something I can’t do and I do it. I once travelled to Israel for a two week pilgrimage for free by doing the liturgy and spiritual direction for 28 young adults! I would in turn get anyone and everyone to sponsor me, get frequent flier miles donated and stay at a monastery the whole 2+ months. Dianna always believed in me, encouraged me to fight, not to give up and trust in my unbelievable faith. She told me to look to Our Lady as my mother, as my mentor had told me. She graciously accepted death, so much so, she made it beautiful. She knew what she was asking of me in going to Lourdes to minister. And she was right, it was a magnificent and special place. My first day I woke to morning prayer with the sisters, had my breakfast setting off to walk from the convent along the river path covered in leaves toward the Grotto, I could feel a peace I never knew. With fear and excitement my eyes were wide in her love, taking in each moment as pilgrims walked by me. My assignment for work that day was a first as well. I would be assisting the sick directly at the Grotto of Our Lady. The first time ever that a woman was placed in this particular job and it was me! I was ever so humbled. I knew right away this meant something, and I knew Dianna was by my side. For two and a half hours I watched people come and pray before Mary, I helped them walk through this ‘cave’ of sorts paying their respects, their sincere gratitude being mouthed in prayer. They stared up at the statue with glistened eyes full of tears, they passed their worn rosary beads along the water dripped rock, and they carried their candles and mumbled in their own foreign tongues, ‘thank you dear lady, thank you.’ I saw something that day I thought I could never truly explain to another. I began to pray to Mary from that day forward. I spoke to her in long conversations of prayer trying to understand why I was there and what the deeper meaning was behind it all. I took long walks along the Sanctuary and the River Gave, sat for hours on end at the Grotto praying my rosary repetitively for all the intentions I brought from the parishioners at home and then for every single pilgrim who walked passed me. I walked along the candle row, through the streets to just sit in Le Cachot where Bernadette had lived…I always ended in the same place in Le Crypt, the chapel that Our Lady asked Bernadette to build and the only one she was actually present at for the opening. I asked her questions sitting in silence for the answers. I asked others about their devotion. I re-read all the stories of her in the bible. I found a friend. When I came home there was a profound deep sadness to leave, it was then my healing journey began. I had a severe crash at one point and upon one return to Lourdes having had a heart attack on the airplane. When I arrived, I went straight to the Grotto in a pouring thunder storm with my back pack and simply stared at her beauty and asked what was next. I had some serious prayer time and reflection with our lady in the days to come. I came to the conclusion about my journey that my friend Dianna had already a long time prior. Fight. Fight for life. Choose life. Live life….because you are loved. I suppose that is it. I felt loved by her. As years passed, I have returned yearly to Lourdes to have these deep and meaningful prayer sessions with her, all the while praying and walking with the pilgrims there at the time. Christmas found a whole new meaning for me. This woman, this amazing, strong woman had a voice. Her own voice. In her silence, she spoke louder than anyone could imagine. I promised myself to always use my voice. I promised Mary on the day Jesus let me live, when I was so sick in my disease, that I would walk with Him as he did His mother. I finally trusted someone. I promised Him and I promised His mother that I would return yearly to her Grotto to pray, to aid, to trust, to love and to give thanks in her name. Mary is many things to many people. That is what is so special about her. She is what she is meant for each person. This is why she has so many titles. This is why we never stop asking the great questions about her. I am not saying I believe in all the apparitions and I have not felt called to go to any of her other sites. I know who she is for me, and this is what we each need to discover. For our faith journey is no one else’s, but our very own. She is my mother in every way.